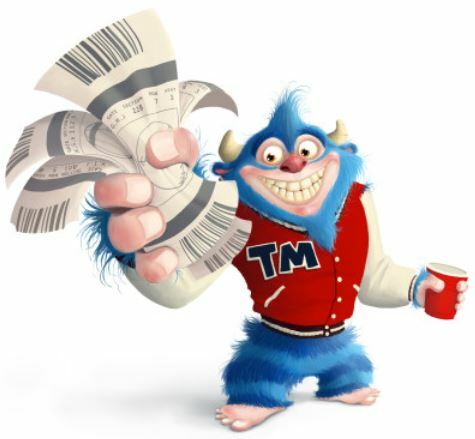 As I do every year over the last 6 years, I’m back to help with some waiver wire adds via my weekly Waiver Favors article! I’m assuming if you’re a returning reader, you won your fantasy football championship last year, so congratulations! But it’s a new year, so I’ll make a couple suggestions after Week 1 of the 2018 fantasy football season. You’re welcome. Again. For the first time in about 2 years, the Cleveland Browns didn’t lose! Of course, they also didn’t win as they ended up tying the Steelers as both sides managed to shank opportunities to win the game on field goals. 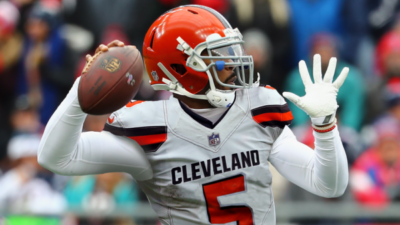 But perhaps more notable than that is that Tyrod Taylor was competent, likely staving off replacement by top draft pick Baker Mayfield for taking over under center. Taylor completed 15 of 39 passes for 197 yards with a TD and an INT, also rushing for a team-high 77 yards and a TD on eight carries. The crappy weather impacted completion percentage, so don’t let that put you off. I doubt you can count on 270+ yards and multiple TDs each week, but it appears that Taylor has upside with a nice floor from the rush yards, which is plenty good as a QB2 in 12-team and deeper leagues and in all 2 QB leagues. As a bonus, Taylor will get a shot against a Saints defense in Week 2 that just allowed 48 points to the Ryan Fitz-magic. Speaking of Fitz-magic, he completely blew the doors off expectations against what was thought to be a solid Saints defense. He managed to complete 21 of 28 passes for a career high 417 yards with four TDs and no INTs while adding 36 yards and a TD on 12 carries. He even had a perfect 158.3 QB rating in the first half. 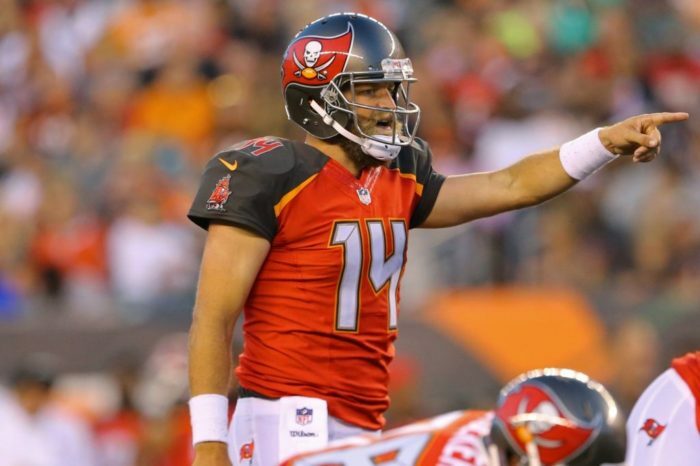 We’ve obviously seen flashes from Fitzpatrick before, but we’ve also seen a LOT of downside over the years. Jameis Winston is probably getting the job back in Week 5, but if you need a 3 week QB rental, he might be worth a look. Maybe to sub in the next time Big Ben plays away from home because…well…you know. 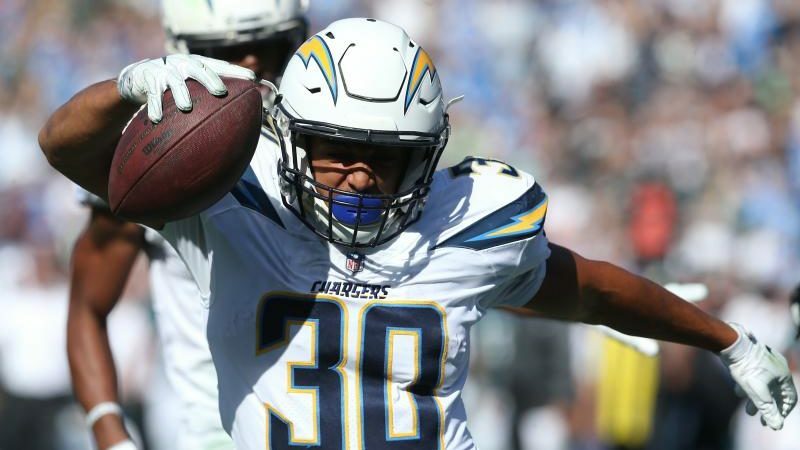 Melvin Gordon is clearly the lead back for the Chargers, but all that talk about making sure Austin Ekeler has a role is for real. Ekeler managed 39 rush yards on 5 carries and caught all 5 targets for 87 receiving yards and a TD. 10 touches isn’t great, but if he ends up around 12-15 touches per game, he could be useful as a bye week FLEX fill-in, particularly for 14-team PPR leagues or deeper. Leonard Fournette went out early with a hamstring injury, and although the Jaguars are optimistic, soft tissue injuries can be tricky for RBs. 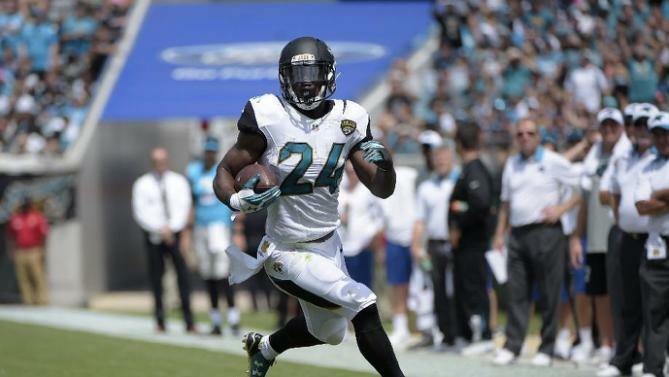 In stepped T.J. Yeldon who proceeded to rush 14 times for 51 rush yards and catching 3 of 7 targets for 18 receiving yards and a TD. Not eye-popping numbers, but he was solid and would be the clear number 1 if Fournette can’t get back on the field. So feel free to pick him up if you’re a Leonard Fournette owner, or looking for a potential starter in 14-team leagues or deeper. And we’re not done talking about Fitz-magic! Mostly because I like saying “Fitz-magic”. But I digress. 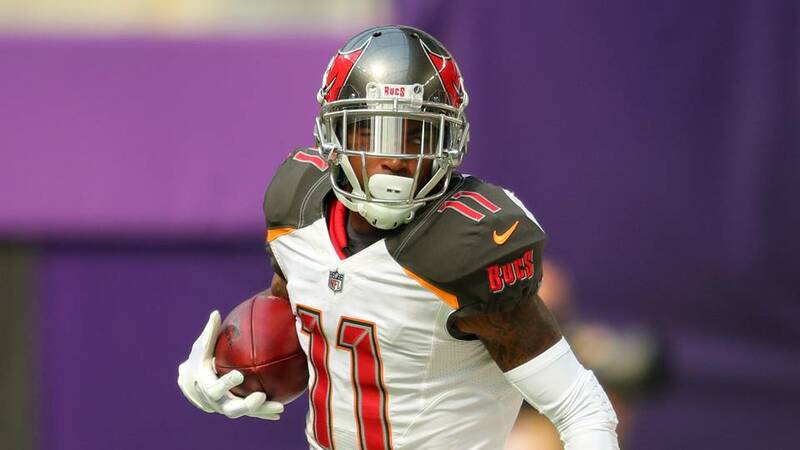 Let’s talk one of Fitz-magic’s favorite targets this past weekend, D-Jax! Jackson managed to grab all five receptions for a whopping 146 yards and two TDs, but then unfortunately took a tough fall and suffered a concussion in the fourth quarter. It’s unclear if he’ll clear the concussion protocol by next week, but he’s definitely worth putting on your watch list on all 12-team leagues or deeper, in case he’s available, at least while Fitz-magic is under center. Oh, and one more thing — Fitz-magic. Love that. Let’s not oversell it, but Cameron Meredith was a healthy scratch in week 1, leaving lots more targets to go around. And Ted Ginn managed to catch 5 of 6 targets for 68 yards and a TD, also adding 5 rush yards. He was also targeted in an unsuccessful 2-point conversion in the 4th quarter. The takeaway here is that Michael Thomas and Alvin Kamara will hog the majority of the targets, but there’s enough to go around to make 3rd option viable in New Orleans, particularly if their lack of defense in Week 1 is any indication of how much their offense will have to pick up the slack this season. He might not be consistent, but he’s certainly worth a stash as a WR4/5 in 12-team leagues and deeper. I bet of all the things you thought you might hear about the Dallas Cowboys after Week 1, it wasn’t that Cole Beasley led all Cowboys receivers in targets, catches, and receiving yards. Yup, you read that right, it wasn’t some elaborate typo. 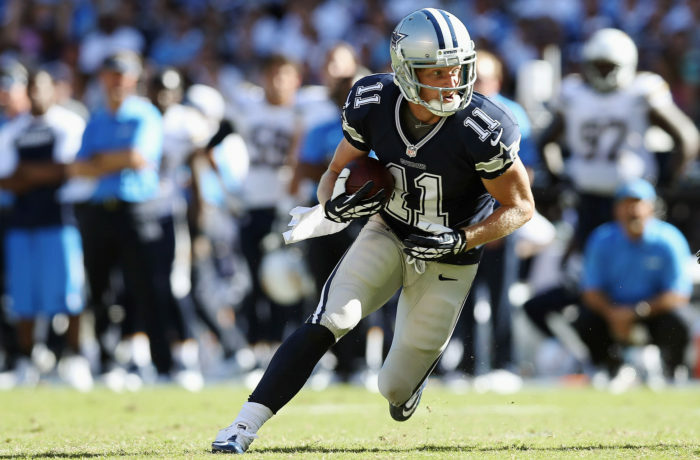 Cole managed to catch 7 of 8 targets for 73 yards on an otherwise day to forget for the Cowboys offense. That might not continue, but rookie Michael Gallup doesn’t quite look ready for prime time yet, and Ezekiel Elliott and a handful of solid runs, but was otherwise bottled up. So Dak Prescott will need an outlet, and that outlet with Beasley, at least for not. If you need a WR4/5 in a 14-team PPR league or deeper, you could do worse than stashing Beasley in case his efficiency increases or starts to see some redzone targets. Again, file this under the “let’s not overreact” column. 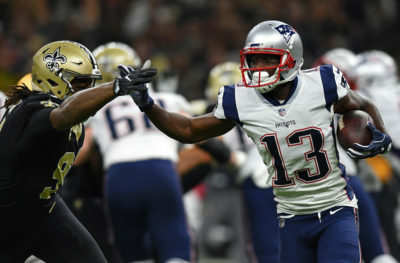 Philip Dorsett was a first round draft pick in Indianapolis that never got his footing and ended up as one of only three WRs on the Patriots roster as Julian Edelman sits out his 4 game suspension. And Dorsett found showing some sharp route running and grabbing all 7 of his targets for 66 yards and a TD against a solid Texans defense. For the next 3 weeks, Dorsett might be a good option, but we all know how Bill Belichick likes to shake it up, specifically game planning for each defense he faces. Plus, his shelf life might be limited once Edelmen returns. But if you’d like a lottery ticket, go ahead and grab him in all 14-team leagues or deeper. Good TEs are tough to come by nowadays with essentially every TE not named Gronkowski flamed out in Week 1. But do you know who didn’t flame out? 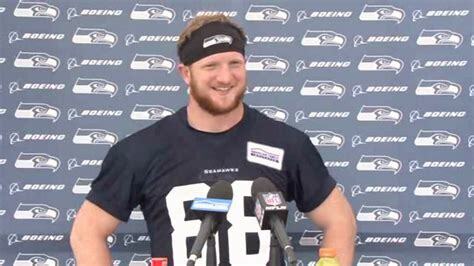 Will Dissly. Will who? So, I have now idea who Will Dissly is aside from the fact that he grabbed 3 of 5 targets for 105 yards and a TD, which was the most yards of any receiving option in Seattle in Week 1. Plus, Jimmy Graham is no longer with the Seahawks. And Doug Baldwin suffered a knee injury which may be a long term issue. Soooo…if you’re feeling lucky, and just lost Greg Olson or Delanie Walker, perhaps you give Dissly a look. Everyone thought that Jimmy Graham would be target 2A with Randall Cobb, but it turns out target 2A was Geronimo Allison. Allison had a nice 39-yard TD in the 4th quarter (which is really hard for me to talk about seeing as how I’m a grieving Bears fan) and ended up catching 5 of 8 targets for 69 yards and a TD. After Allison, there are only rookies pushing for targets, so I like his chances as a WR4/5 or Flex in 12-team leagues or deeper. Yeah, he’s just over the 50% requirement, but he’s worth mentioning anyway. The Lions were TERRIBLE, but Golladay managed to be a bright spot in an otherwise dismal performance as he caught 7 of his whopping 12 targets for 114 yards. Sure, the Lions were behind for much of the game, so game script dictated more targets, but he’s clearly got Matt Stafford’s attention. If he averages 8-10 targets per game, he could be a monster in 12-team PPR leagues and deeper.